Your Ducks one is amazing. The organization of the stripes is perfect, and I like the decision to have straight stripes on the sleeves. 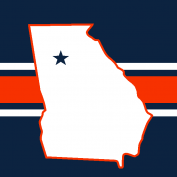 I don't think I've seen anybody do the stripes where the logo overlaps it. I think that's going to garner some complaints, but I don't mind it. It's bold. Bold enough to work imo. With the Pens, you have too many bumper stickers. I think you've done this with every iteration of this hand-drawn series, trying to combine every era you can into one set. It's just too much. The triangular yoke cutting into the sleeves where it meets stripes then cuffs? And the alt is super busy, made moreso than previous versions with the diamond-plate. I think you need to go back to the drawing board on the Penguins and focus on one major element - 90s yokes or 80s looks, and maybe put the other one into the third jersey. Maybe some food for thought - those triangular yokes were gold for the Golden Triangle of Pittsburgh. They're never any other color. If you can't have a gold yoke, then don't go triangular. The rest of the sets are amazing, as usual. Nashville is perfection, big original Canucks vibe (like, 1970, not the version that is usually used as a throwback) and it's excellent. I think you're trying to do too much with Pittsburgh. is there a reason you went with straight arm stripes opposed to angled up? Other than that, the only thing i'd change is the lace-up collars, but i love this set. Amazing work all around, as always. Preds: Their current look was only a few tweaks away from perfection and you nailed it. They pretty much own yellow in the NHL now so a yellow third not only sets them apart in a way, but would also solidify their "ownership" of the colour. The third is nice, but in spite of the addition of silver it is just a little too similar to the home jersey, though I get what you were going for with it. Sens: I've advocated for them going with the =O= look full time, or replacing the current 3D Sen head with the much better, unused 2D version. I love the laurel leaf patterns and that's a very unique detail, needless to say it's still impressive that you were able to hand draw that and have them at almost identical sizes. I don't know if it needs the 3D Sen shoulder patch as that's essentially a repetition of the theme of the main crest, maybe put the =O= there instead. Still, if I were in Sens management and was presented with this, I'd be pretty much sold. Pens: Hard to improve on the current Pens set (aside from the white jersey hem at least), but this is nice. The steel pattern is an interesting addition, but the triangular yokes on the home and roads complicate the design a bit too much. Love the third, though! Ducks: The D logo overlapping the stripes is going to set off some OCD (And speaking of OC, I have to admit that I really don't like that patch. It worked in the context of the Stadium Series but not as a full time alternate mark). As @hockey week has pointed out in the NHL logo threads, the stripes of the 2006 Ducks jerseys were modeled after the swooshing shape of the D logo. 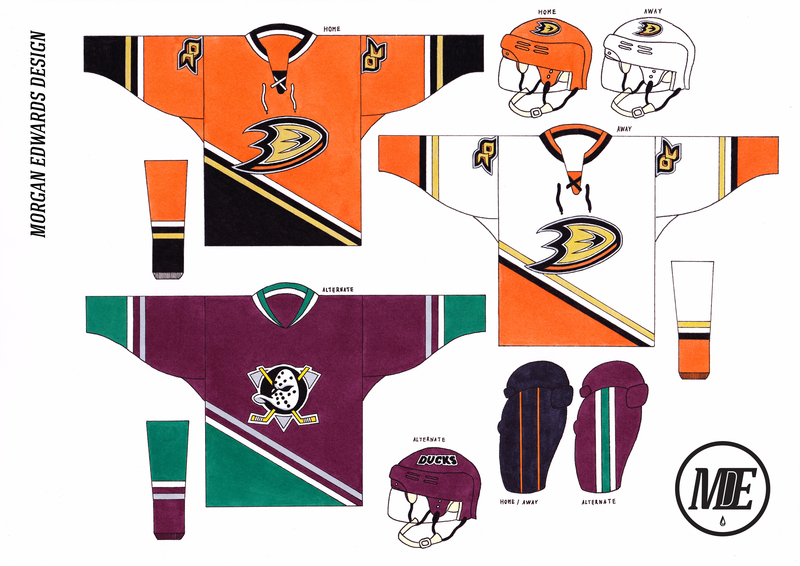 Notably, the bottom of the crest is left-heavy and whenever the combination of Mighty Ducks diagonal stripes and Anaheim Ducks webfoot D is used in concepts like this, it leaves an awkward empty space to the bottom right. If they're going to have diagonal stripes with this logo, they need to be going up the other way. Interestingly, the workmark used on the throwback third is exactly as it appears in some of the NHL 2K videogames where the original set appears as an option. IIRC the EA NHL games just used the full name instead. This is amazing! I like the use of the OC patch on the home and aways. I also love the idea of an orange helmet. Only thing I'm not sure about is the laceup collars. Appreciate it! I didn't think the overlapping logo would be a big deal since the numbers would overlap on the back anyways. With the Pens, you have too many bumper stickers. I think you've done this with every iteration of this hand-drawn series, trying to combine every era you can into one set. It's just too much. The triangular yoke cutting into the sleeves where it meets stripes then cuffs? And the alt is super busy, made more so than previous versions with the diamond-plate. I think you need to go back to the drawing board on the Penguins and focus on one major element - 90s yokes or 80s looks, and maybe put the other one into the third jersey. Maybe some food for thought - those triangular yokes were gold for the Golden Triangle of Pittsburgh. They're never any other color. If you can't have a gold yoke, then don't go triangular. Teams like Pittsburgh are tough. You don't really want to change what they currently have but if you didn't, it wouldn't really be a concept. The safe thing to do would have been to just change the hem stripe on the road but I wanted to push myself and come up with something new. Maybe its a little on the busy side but I'm pretty pleased with how it turned out. It's likely I will update a few teams after all 31 are posted so maybe I will go back to the drawing board. At any rate, I appreciate the constructive criticism. I didn't think the diagonal sleeve stripes were necessary. The main focal point of the uniform is the diagonal hem stripe so I straightened the sleeve stripes to make it more prominent. Appreciate you taking the time to critique all the concepts posted thus far. You're making me feel bad about ripping on the Ducks so much . I knew the OC patch wasn't going to be liked by all but I think it compliments the Duck Foot better than the current roundel. I see what you mean about the empty space but it would be there with the diagonal stripe reversed as well. Maybe it will see an update in the future. A lot is depending on the Adidas reveals at the draft. Looks nice! Might be my computer, but the eggplant looks more red than purple. I like the emphasis on Orange than Black. This is totally random, but the OC on the Ducks jerseys looks a little bit like a duck. The O being the head and the C being an open bill. I'm sure that wasn't intentional, and it's not incorrect, but now that I've seen it, I wonder if there's a concept idea there. Pittsburgh- To be honest, this look is busy but I think you went ahead and added all the extra details in subtly enough for it to work. The mix of the early 90's & late 90's looks works wonders here. The one that's a swing & a miss though is the sublimation on the cuffs. It feels like it was a detail added for detail. 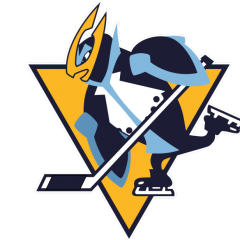 As for the alt, I'm going to admit I prefer the Robo-Pen logo & this is a nice update of that jersey while also being yellow. Anaheim- 100 times YES. This is a win in more ways than one. The orange at home really pops & so does the striping. I like the "OC" patch used on the shoulders, as it allows the Ducks to really own that moniker. Plus, it's a unique take on the MD patch of the old Black & Jade alternate. The one thing I'm not certain about is the orange helmet. Part of me feels like it would be like Nashville's helmet, but another part of me worries it's a little too outlandish & wouldn't work on the ice. Also, THANK YOU for fixing the Ducks pants. The single stripe always bothered me. Since the North Stars and Stars are the same franchise with shared record books and history, I've always advocated they adapt elements of their original identity. The main set is modeled after their 1988-1991 look which, in my opinion, is one of the greatest uniform sets of all time. To further the "classic" feel, I added tri-coloured lace ups, vintage white to the home iteration, and made the logo as direct as possible; a simple, italicized star. The pants retain the three stars but I decided to go with green to make sure the road look wasn't too black-heavy. 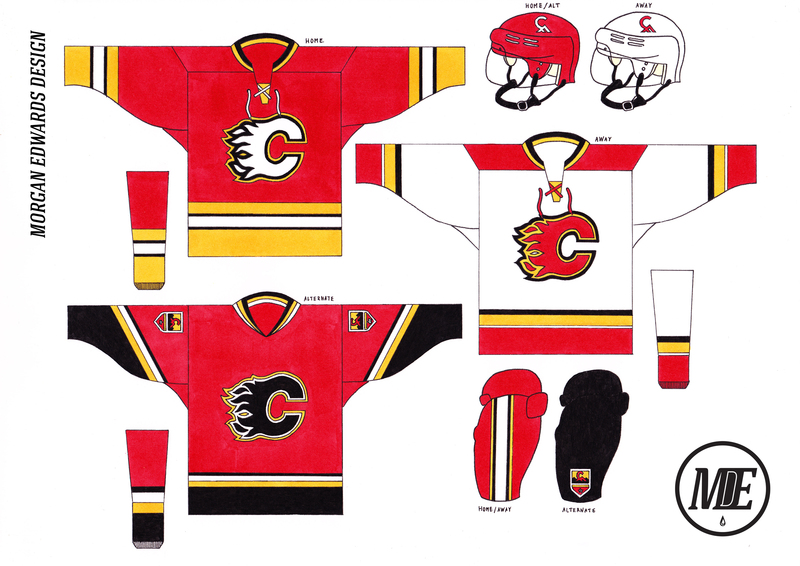 The alternate is there to evoke the 1993/94 set with some minor changes. I took the current 'Texas' patch, replaced silver with gold and applied the original italic star. Green is a little more prominent and I nixed the shoulder to sleeve yokes that interrupted the sleeve stripes. The 'Dallas' script returns to the pants and is now framed with thicker, green stripes. C & C welcome and appreciated, thanks for looking! 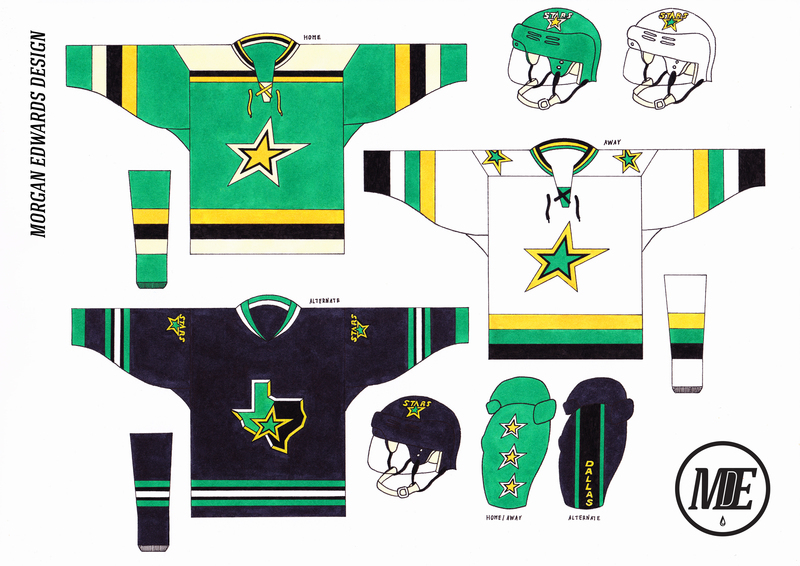 The jerseys look great and I like that you went all out on the green but I'm not really feeling the vintage white for the stars. I'm curious to see what you do with the wild with the stars in all green. Keep up the good work man. I'm curious to see what you do with the wild. 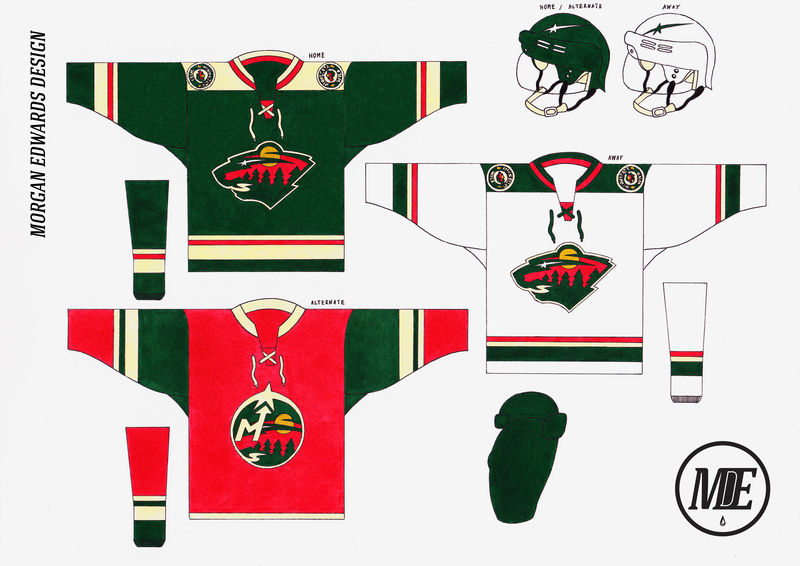 With Dallas rightfully adopting the North Stars identity, I wanted to create an alternate look that gave a subtle nod to Minnesota's original team without infringement. Since it wouldn't work on Dallas, an altered version of the 'N-Star' appears on the main crest of their alternate as a tribute. A solitary 'north-star also appears on the helmets to solidify this connection. The main set is based off current road jersey, with red and wheat being worked into the traditional striping for a more cohesive look. The scenery bear is one of the best logo's in NHL history so it only made sense to put it on both jerseys. C & C appreciated as always, thanks for looking and commenting! Oh my gosh. In my mind it's a perfect duck. I will probably never unsee that. The star on the helmet is genius though! Love the star on the helmet. I wish more teams did little things like this rather than stick the primary or the wordmark on the side. 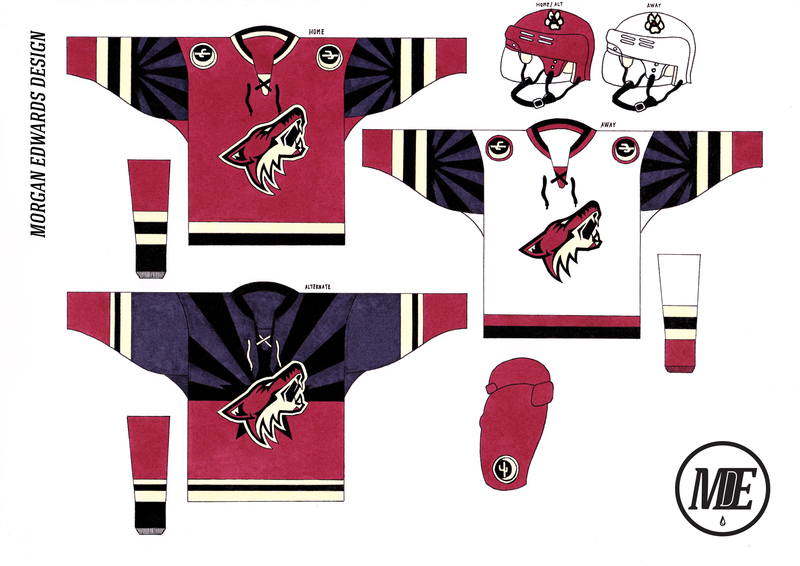 The Coyotes current set has really grown on me so my goal was to take its basic essence and make it bolder. The most important change was to implement real hem-stripes and fix the weird inconsistencies with the cuff stripes. 'Sand' is now a prominent part of the striping configuration to make things more cohesive with the primary crest and I added a sublimated flag-pattern to the upper sleeves for some added personality. I replaced the shoulder patches with a logo that hints at the inaugural look to honor the teams history and demoted the 'paw print' to the helmets. For the alternate, I drew inspiration from the alternate class of 1996 but opted against tacky gradients and asymmetries. The sublimated flag-design takes center-stage on a dual-colored jersey, reigned in with traditional striping on the hem and sleeves. C & C is very much appreciated, thanks for looking! Absolutely amazing! This is one of the greatest Coyotes concepts I've ever seen. I really like the 90's inspired alternate, it represents Arizona very well. Coyotes: Massive improvement over the current set. The third is an interesting way of having two dominant colours without the silly Turd Burger cape effect, and I wonder how that'd look in action. The only change I'd make would be to swap the red and black sleeve portions on the white jersey, but I can also see how that might not work as well with your subliminated design.